Meet the Full of Fun Lion! His fun colors make him fun to crochet and fun to cuddle. 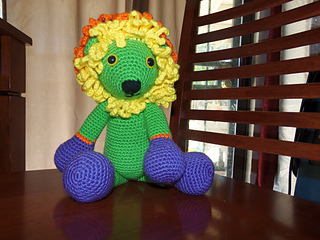 He is designed to be made with your favorite colors or your little lion lover’s favorite colors. He measures approx. 19 inches laying flat and 11 inches sitting up (including his hair).